Boy do I love food blogging / photography, but it tends to make me too hard on myself when food doesn't turn out as pretty as the original book / magazine / blog photo. (I bet I'm not the only one this happens to 8p.) So I'm lucky my boyfriend P was around to remind me how much these orange hazelnut biscotto from this weekend rocked the flavor department (and without any eggs or dairy! ), despite my accidentally baking them too hot (oops!). In the words of the boy himself "the deliciousness outweighs the burniness." (um yea...he makes up words pretty often) These cookies were indeed fabulously infused with citrus flavor due to a whole orange's worth of zest. Plus with buttery hazelnuts and a melted chocolate coating, an already good thing became damned addictive. After gobbling up 3 in quick succession, P even asked me to set a limit for him. I took this to mean I had to eat the rest so that he wouldn't ;D...you agree? This delightful (and resilient ^-^) recipe comes from the fabulous dessert cookbook, My Sweet Vegan, by Hannah Kaminsky, who is a prolific young baker and fellow blogger. She's kindly allowing me to share this recipe from her book. I hope you enjoy this yummy biscotti (avoid my missteps and yours will definitely look AND taste great), and watch for my cookbook review to come your way soon. P.S. - It's P's birthday today. He's the calm to my frenzy, the root to my tree. Love you lots and hope you enjoyed the day, Sher! Cream the margarine in your mixer until light and fluffy in texture [but don't let it sit out too long like I did]. Add in the sugar, beating until fully incorporated. Grind the flax seeds into a powder with a spice grinder, and whiz them together with water to form a paste. Add the flax seed mixture to your mixer, stirring well. Toss in the zest from your orange and mix again. Sift in the flour, baking powder, and salt, mixing lightly until relatively combined. Continuing with the mixer on a slow speed, dump in the hazelnuts, and slowly juice your orange into the mixer until it just comes together [I pre-juiced it cause I tend to be clumsy on the fly]. It may take more or less juice, depending on the variety of orange you use and how well you can squeeze your fruit! If the dough is still crumbly, grab another orange and extract just enough juice so that everything comes together. Shape the resulting dough into a long, skinny rectangle about 1 inch tall by 2 inches wide by however long that ends up, and place it onto your prepared baking sheet. Slide the baking sheet into the oven for 35 to 40 minutes. The top of the biscotti loaf should be lightly browned, but don't panic if it seems a little bit soft and bread-like on the inside. Cool the biscotti for at least 5 minutes, and slice horizontally into cookies that are about 1/2 inch thick. Lay the slices down flat on one of their cut sides on the baking sheet, and return the biscotti to the oven for another 10 minutes. Allow the biscotti to cool completely. Place the chocolate in a relatively shallow, microwave-safe dish that can accomodate the full length of your biscotti. In the microwave, melt your chocolate in 30-second intervals until it is completely smooth, stirring well after each interval. 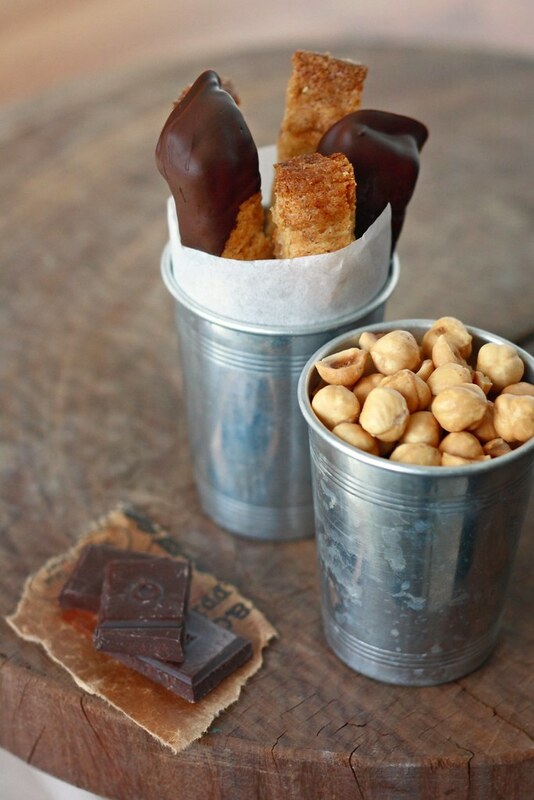 Dip one cookie into the chocolate and place it back on a silpat or parchment paper. Repeat this process with each cookie. Allow the biscotti to dry completely before moving them again. I thought these biscottos look really gorgeous and beautifully captured. Well biscotti has never been the prettiest cookie out there. But it sure is one of the tastiest! I love that you dunked them into melted chocolate! I've come to the conclusion that biscotti just don't photograph well. And that I have to be okay with that. noobcook & Joanne - thanks for the compliments! i actually realized i was being too negative and re-wrote my original post a bit. thanks for the encouragement. Danielle - yea melted chocolate really put this over the top (in a good way), so I love it too. also, i promise i will write back about photography. thanks for being patient! What a wonderful flavor combo for a biscotti! I LOVE these! What a great tip about rubbing the zest in the sugar. Ithere is something wrong with the appearance of these biscotti. I sure don't see it. They look fabulous and the first photo is so well composed. Your photos are fabulous and the biscotti sounds delicious! I'm having a giveaway on my blog! Oh goodness! I just made Dorie's White Chocolate Brownies and rubbed orange zest into sugar. Delicious recipe. I'm loving the orange flavor right now so I think I'll have to try this recipe out too! You are definitely too hard on yourself! Leave it to Mr. P to put things in the right light for you! Happy Birthday to him! Nice composition on both shots! I need to remember these. You give me some nice ideas. Don't think of the biscotti as burned. Think of them as beautifully caramelized! I love the orange-in-a-bowl in that first shot. Hehe actually I thought the photography was gorgeous! :O Seriously don't be so hard on yourself, they look amazing! Your photography is gorgeous! I know what you mean though, isn't it great to have a boyfriend to gobble up whatever you make. There's no better reassurance than someone having a 3rd helping! Thank you for sharing the recipe! Thanks for the kind words, everyone. I now wish I hadn't have been so critical, but I'm gonna be more positive from now on I promise XD. Danielle - I'm glad you like them - thank you! WizzyTheStick - Dorie deserves the full credit for that but I'm so glad I was able to introduce more people to that tip :). Katrina - Thanks for the compliment and for letting me know about your giveaway. I'll def. have to stop by! smalltownoven - please do try these and white chocolate brownies sound just divine. Trissa - I'll pass on the birthday wishes to P - thanks! Laura - "caramelized"...I love it! And I take it as a great compliment that you would like my composition enough to want to remember it :). Lorraine - Aw thanks sweetie. I'm learning to accept things as they are and appreciate them :). Koko - It sure is lovely. It also helps minimize my own consumption (and weight gain) 8p. 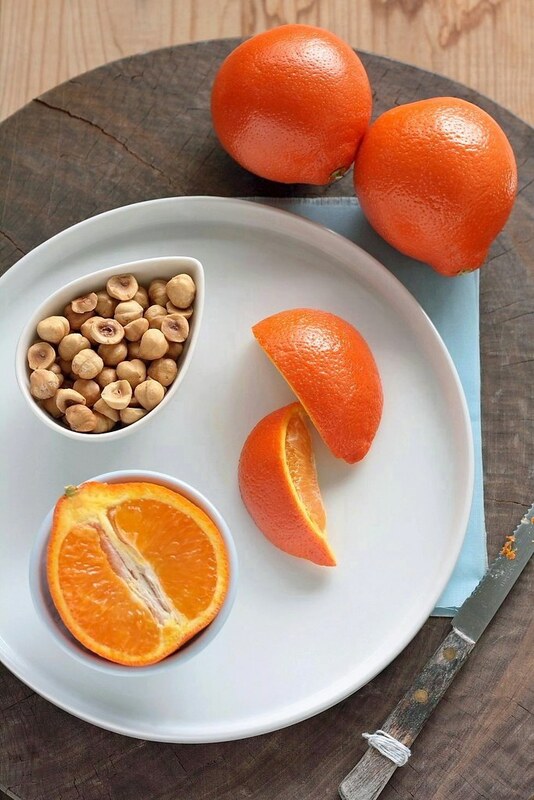 I love the flavours of orange and hazelnuts! I am sure the biscotti tastes dleicious! Veggie Belly - Thanks Sala! I actually got it for less than a buck at Goodwill! I think I glimpsed some thriftstore finds on your blog recently too, so I know you understand how awesome it feels to get a great find for cheap =D. Ellie - These flavors were just perfect together. I may have to try to combine them in other treats too. Hannah - I only said what was true. Thanks for letting me share this amazing recipe. I'm getting there slowly, but I promise to have the review up soon :). Love the photos! Often times my food doesn't turn out as pretty as it is in a book.. but it still tastes good (usually)! That's what matters. These were excellent! I added dried cranberries for a little extra tang. Yay! So glad you liked them -- cranberries are a great addition, it sounds like! Lemon Sponge Pie and GIVEAWAY!